handmade, hand-painted, hollow core surfboard, Paulownia wood, fibreglass, synthetic polymer paint Collaboration with Peter Walker, specialist wooden board maker. 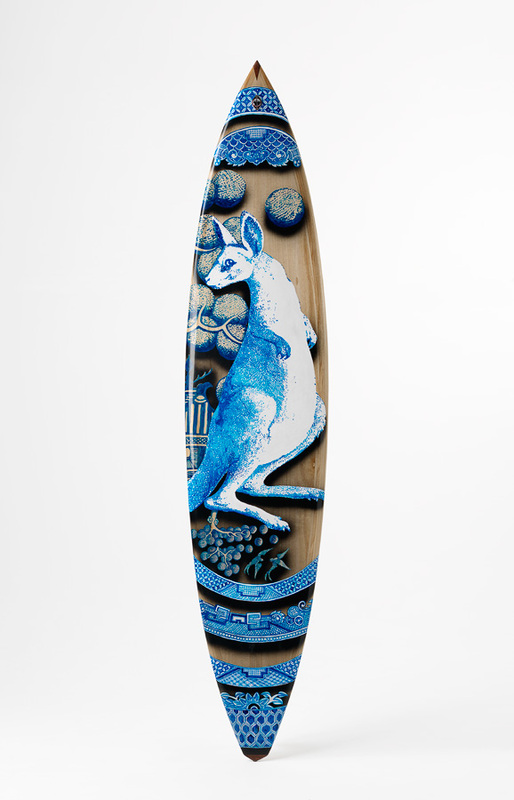 Motifs on the boards are dominated by the features of a particular image of a Kangaroo. As often seen in the artist’s work, this image is a reference to the copper plate engraved image published in the 1773 Hawkesworth edition of Captain James Cook’s voyages of exploration in the southern hemisphere. The copperplate being, in turn, based upon George Stubbs’ iconic oil painting of the same era. The background elements of blue willow pattern are derived from types defined by Robert Copeland of Spode as well as those taken from Wedgewood patterns from the mid 1800s. The details of scroll and flower border patterns which frame the kangaroos are derived from a mix of Spode, Wedgewood and others. These patterns as they appeared on early industrially made tablewares of late 1700s and early 1800s being typically transferred to the plates by use of copperplate print making technology.